I’ve been making these easy no-bake brownie bites over the past year and am still surprised by how easy they are to make. The brownie recipe is popular with vegans and raw foodies, but I’ve got to tell you, these brownie bites shouldn’t be shunned by brownie purists. Not only are these brownie bites delicious, they are also a healthy and quick to make dessert option. The brownie recipe only requires 3 ingredients — plump dates, almonds, and cocoa powder (use the best one you can afford). You blend these ingredients in a food processor until it’s a fine meal and starting to clump together. You then press into a brownie pan and refrigerate, or you can roll into balls as I’ve done. And because the size and shape makes them portable, they make the perfect afternoon snack or lunchtime treat. What kid wouldn’t love to find one of these brownie bites in their lunchbox? You’ll find these brownies to be sweet, chewy, dense, and full of a deep chocolate flavor. I played around and dressed up some of the balls in a coating of dark chocolate for an even more sinful treat. 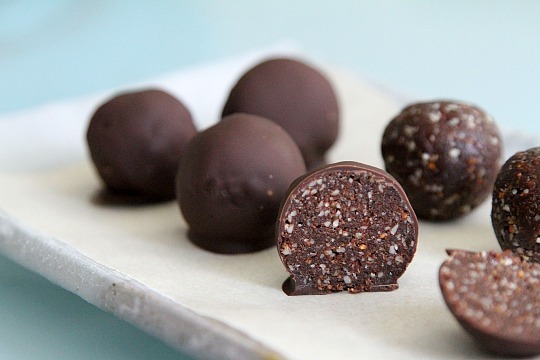 You can also roll the balls in cocoa powder or chopped nuts for a truffle effect. Begin by pulsing the almonds in a food processor until the pieces are the size of small pebbles. Add remaining ingredients and continue pulsing until the mixture is fully combined. The mix will appear crumbly but should hold together when pinched between your fingers. Since the mix depends on the moisture in the dates, you may need to add one or two extra dates if the mix isn’t holding together. Press brownie mix into an 8″ pan for square brownies or roll a rounded teaspoon full between your palms to create bite-sized brownie balls. Refrigerate until firm. You’ll notice the white flecks of almond in the final product and this is to be expected. It lends a subtle texture. If looking to coat in chocolate, simply melt your favorite chocolate bar in the microwave (checking every 20 seconds to stir). When the chocolate is fully melted, roll the balls in the chocolate and place on a waxed paper lined tray. Place into refrigerator for 10 minutes to allow the chocolate shell to harden, then put into an airtight container and keep refrigerated. Lately, I’ve been using the Green & Black’s Chocolate brand and absolutely love its rich flavor. It’s also organic, ethically produced, and not that much more expensive than common store brands. Green & Black’s chocolate is also becoming more available in my local grocery stores which is great. In the brownie bite recipe above, I used both the Green & Black’s cocoa powder and the 70% dark chocolate bar. FYI, I don’t have any affiliation with the brand and wasn’t given any freebies, I just really like their chocolate.